​uBreakiFix specializes in same-day repair service of small electronics, repairing cracked screens, water damage, software issues, camera issues and other technical problems at its more than 170 stores in North America. uBreakiFix Derby opened March 1. DERBY, KS--(Marketwired - March 01, 2016) - uBreakiFix specializes in same-day repair service of small electronics, repairing cracked screens, water damage, software issues, camera issues and other technical problems at its more than 170 stores across North America. 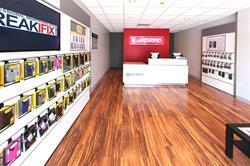 Its newest location, uBreakiFix Derby, opened March 1 at 1700 N. Rock Road, Suite 200. Store owners Bill Ramsey, David Hensley and Bryson Butts are looking forward to broadening the reach of uBreakiFix in the Sedgwick County area. The team has plans to expand into Northeast Wichita in the near future. "The first impression I had of uBreakiFix was its reputation for convenience and quality," Ramsey said. "Our stores promise to uphold this value and continue serving our community through customer-focused service and remarkable tech repair."